The theme comes from a viral video of Issa Rae, actress and creator of HBO’s Insecure, who said during a red-carpet interview at the Emmys in 2017 that she was rooting for everybody black to take home awards that night. Dr. Dyson took this idea a step further. As he explained during this keynote address, the reason we are rooting for black people is because “America has excluded the participation of black people in so many arenas. "The reason we've got to root for people by color at all is because America has denied opportunity systemically and systematically to so many peoples, including peoples of color, but especially black people,” Dr. Dyson said. The Monday-night event in the Dorothy Betts Marvin Theatre kicked off the 50th anniversary of the Black Heritage Celebration at GW, sponsored by the Multicultural Student Services Center. The celebration features a series of programming throughout February that promotes the values and traditions of African-American, Caribbean, African and Afro-Latino cultures. Xavier Richie, a senior studying electrical engineering and the external relations representative on the Black Heritage Celebration Committee, invited the GW community to join in rooting for everybody black. 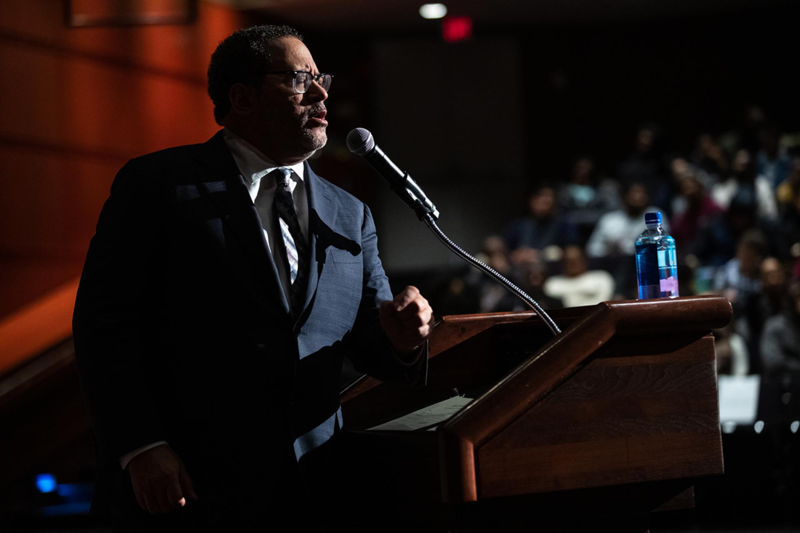 Michael Eric Dyson delivered an impassioned keynote address to kick off this year's Black Heritage Celebration. To further explain “rooting for everybody black,” Dr. Dyson used the example of Kanye West at the MTV Video Music Awards in 2009, when he interrupted Taylor Swift’s acceptance speech in defense of Beyoncé’s “Single Ladies.” Mr. West was acting out of frustration of talented black people not receiving proper recognition for their work and being excluded from consideration, Dr. Dyson explained. This is a trend throughout history, Dr. Dyson said, from Chuck Berry’s role in rock-and-roll being overlooked in favor of Elvis Presley, or Pat Boone selling more records than Little Richard for the same song. Even though Mr. West was “rude and polarizing and divisive,” Dr. Dyson said, he was making a bigger point. "Black talent, black genius, black girl magic, black boy joy, black female creativity, black male wizardry, black children's enormous imagination all shunted to the periphery,” Dr. Dyson said. “[It’s] not seen as worthy of celebration, not given its due—worthy to be appropriated, never to be applauded." Dr. Dyson also noted that black people who pioneered with their own “firsts,” such as Jackie Robinson in Major League Baseball and former President Barack Obama, were not the first capable but the first seen as acceptable or palatable to the dominant culture. But still, Dr. Dyson said, this talent was rooted against for no reason other than its blackness. So, he encouraged the audience to also root for everybody black and for black people to continue rooting for each other. “At the end of the day, we are all we got,” Dr. Dyson said. “Let's learn to love each other, celebrate each other, embrace each other and then, when we root for everybody black, everybody black begins to root for us. “Together, we remake the possibilities of a magical, beautiful, transformative blackness." What Cause Will You Fight For? Activist Shaun King spoke to high school students at the International Baccalaureate World Student Conference about advocating for their beliefs and remaining hopeful for change.